Episode 39 – BlizzCon Banter! Episode 39 shows up (a little late in the day) and discusses the happenings of BlizzCon 2011! No, Kurn and Majik weren’t there, but that doesn’t mean there’s not a lot to say about the weekend’s events! MMO-Champion has everything you need to know about the upcoming WoW expansion and BlizzCon coverage. MMO Melting Pot has a great breakdown of all the new talents for each class. Vote for Kurn as Loudest Voice on Twitter for the Stopies! (And vote for MegaCode as Most Dedicated Listener!) Definitely tweet Kurn if you vote, and use the #votekurn hashtag! If you went to BlizzCon, we’d love to have your audio submissions (by midnight ET on Monday night/Tuesday morning) sent to us at podcast@blessingoffrost.com! 4) Quick (!) thoughts about the new expansion — love it, hate it, what you’re looking forward to, if anything. Even recording on a smartphone and sending it to us ought to work, so submit ASAP and we’ll get it in Episode 39 of Blessing of Frost! Episode 38 – Happy Hallow’s End! Another holiday is upon us and, yet again, Kurn and Majik tackle the various achievements related to the holidays. Of course, shortly after recording the episode, Wowhead came out with a guide that shows that the holiday has changed to remove the majority of the randomness from it! From October 18th, 2007 (! ), Toga, Tia (as Tweetybird) and Kurn (as Madrana) take down the Headless Horseman! @SturgarHawkwind: Just before WotLK hit, during Hallow’s End, I tried transferring my main. Got stuck in limbo for two weeks; missed most of the event as well as all of the end of the Scourge Invasion. I still curse myself for not getting a Vampiric Batling. @FFPMMarc: We getting any epic loot from it this year”Hallows End”?? @TiaofET: Isn’t that when you me and toga three manned the boss for our pumpkin heads and CANDYYYYYYYYYYYYYYYYYYYYYYYYYYY!!! 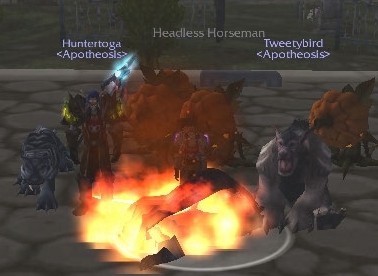 @SerrinneWoW: Here’s my Hallow’s End story: I have 3 headless horseman mounts. 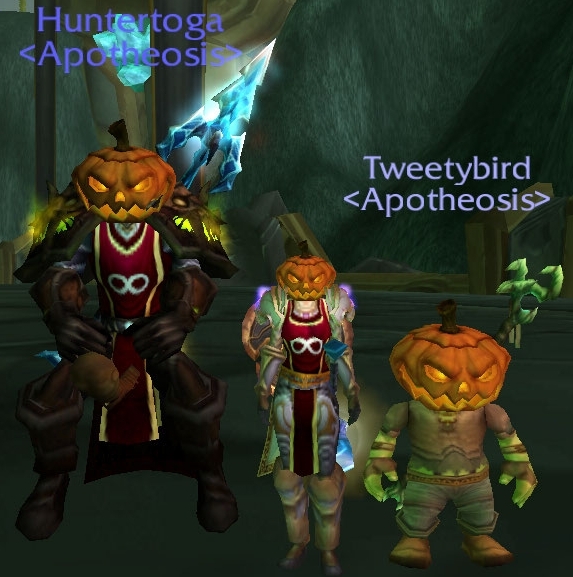 @TikariOfET: One time I was minding my own business in Stormwind, and Kurnmogh pumpkin-headed me. Still pretty awesome after all these years. @kurnmogh and @Majjity for us and then @ApotheosisET for our guild. Episode 37 is here, complete with obscure references to the movie Clerks, as well as some talk about burnout as it pertains to WoW. Our special guest this week is Mylana, a combat rogue from Choice of Skywall (currently 3/7 25-man HM, looking for DPS and healers!). Finally, please rate us up on iTunes and leave us a review! We are sad pandas without reviews and ratings. Please prevent our sad pandaness by giving us a quick review! For those of you who are as uneducated as Majik is about who Athene is (hint: The Greatest Paladin in the World! ), here’s his very first video. It starts out slow, but picks up around the third and especially fourth minutes and is absolutely hilarious to watch if only for the “whoosh, around the corner” thing or the “You’re pro or you’re a noob. That’s life,” sentiment Athene expresses. I’m not particularly a fan of his, but this guy can be hilarious. Thanks again to Megacode from the Knights of Tranquility over on the Scryers server for sending in his thoughts about the Firelands nerfs! Apotheosis took down Heroic Beth’tilac this week as well as Heroic Alysrazor. Check out our kill videos! Thanks again to Nassi from Choice for coming on to the show! Finally, please rate us up on iTunes! You’ll earn yourself a shout-out from one of us (5 stars for Kurn, 4 stars for Majik) at the end of the show if you rate us up and leave us a review! We are sad pandas without reviews and ratings. Please prevent our sad pandaness by giving us a quick review!